With reference to the public announcement inviting suggestions on the anti-corruption Lokpal Bill, 2011 by the Parliamentary Standing Committee on Personnel, Public Grievances, Law and Justice, I wish to highlight certain facts that show a clear conflict of interest among some Hon'ble members of this Committee and the sensitive Bill. These members include Dr Abhishek Manu Singhvi , Shri Lalu Prasad, Shri Amar Singh, Shri Manish Tewari and Shri Parimal Nathwani. MR. CHAIRMAN in the Chair. to speak. ...(Interruptions)... Please allow him, Sir. MR. CHAIRMAN: Please listen. ...(Interruptions)... One minute. MR. CHAIRMAN: Do you wish to say something? ...(Interruptions)... Let us hear the Leader of the Opposition. MADAM SPEAKER: Hon. Members, I have received notices of Adjournment Motion from Sarvashri Yogi Aditya Nath and Shailendra Kumar regarding reported agitation by Shri Anna Hazare, social activist against the Lokpal Bill. Shri Ramkishun has also tabled a notice of Adjournment Motion on reported flood situation in eastern Uttar Pradesh and Bihar due to heavy rains. The matters, though important enough, do not warrant interruption of business of the House for the day. I have, therefore, disallowed the notices of Adjournment Motion. MADAM SPEAKER: Hon. Members, I have received notices of suspension of Question Hour from Sarvashri Gurudas Dasgupta, Basu Deb Acharia, Smt. Sushma Swaraj and Shri Shailendra Kumar regarding reported fast unto death by Shri Anna Hazare. (Reuters) - Federal Reserve Chairman Ben Bernanke, an expert on the Great Depression, once promised that the central bank would never repeat its 1937 mistake of rushing to tighten monetary policy too soon and prolonging an economic slump. He has been true to his word, keeping interest rates near zero since late 2008 and more than tripling the size of the Fed's balance sheet to $2.85 trillion. But cutbacks in government spending may end up having a similarly chilling effect on the economy, and there is little Bernanke can do to counter that. When the big banks screamed "crisis," they were instantly rewarded with trillions of taxpayer money. Likewise, when rich bondholders — some of them bailout beneficiaries — yelled "crisis" at the U.S. debt, they were immediately rewarded with trillions of dollars taken from social programs for the poor. The jobs crisis, however, staggers on with no relief in sight. The recent troubles in the U.S. economy are forcing working people to reexamine their hopes for a recovery, as has been promised to them for years. They will not wait much longer. Standard & Poor's decision to strip the United States of its triple-A credit rating, whether we agree with it or not, signals a turning point for the entire global economy. Because of the unique role the U.S. plays in the world economy, a downgrade of the U.S. isn't anything like a downgrade of Greece or Spain. For the last century, and especially since the end of World War II, the modern global economy as we know it was built on top of America, relying on its economic strength as a foundation, and using its currency as the primary tool of world economic discourse. In many ways, the world has benefited greatly from that U.S.-led system. The past half century has seen unprecedented economic integration and poverty alleviation, uplifting hundreds of millions out of destitution on a scale never before witnessed in history. America, simply, has been the economic engine that made the world go around. Investors will be anxiously watching when the New York Stock Exchange market opens Monday morning to see what effect Standard and Poor's downgrade of the U.S. credit rating will have on trading. The stock market fell by 7.1 percent last week, before S&P issued its report of the downgrade at the end of the day on Friday. The market fell despite the bill signed into law last Tuesday that allowed the raising of the debt limit to prevent the government from defaulting on its financial obligations, accompanied by a deficit reduction package aimed at trimming $2.1 trillion of deficit spending over the next 10 years. 2. Expert views: How will US downgrade impact global markets? The US crisis, aggravated after the downgrading of its sovereign rating by S&P, could severely affect India on account of a dent in country's exports to the world's largest market, business chambers said today. CII, FICCI, Assocham and FIEO expressed concerns over events in the US economy, one of the biggest markets for Indian merchandise and software exports. 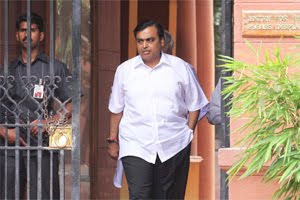 Is the Maharashtra government dillydallying on ordering a CBI inquiry into the issue of the alleged illegal sale of Waqf land to industrialist Mukesh Ambani for his 27- storey ultra luxury home that is worth nearly $ 2 billion? The state government had received a letter from the Union government in June, asking it to consider ' referring' the matter to the premier investigating agency to probe the land deal. The state has, however, not taken any decision on the matter yet. The land deal on Mumbai's posh Altamount Road has been embroiled in a controversy ever since Ambani began building his multistorey residence Antillia. On Monday, the issue was raised in the state assembly by Opposition leader Eknath Khadse. He said the Rs 500- crore plot was shown to have been sold by the Karimbhai Ibrahimbhai Khoja Charitable Trust for just Rs 21 crore. The piece of land was originally reserved for educating children of the Khoja Muslim community.